"Beware a mermaid's wrath!" the mermaid Soop warns the water-talent fairy Rani. Soop has grown tired of waiting for the magic wand that Rani promised her in exchange for her help saving Never Land. And though Rani would love to fulfill her promise and bring Soop a wand, Mother Dove, the wisest creature in Never Land, has forbidden it. Her patience at an end, Soop sends a flood to destroy Fairy Haven. Now the only thing that can save the fairies' home is the arrival of the wand. Rani, Tinker Bell, and the fairy queen, Clarion, set off on a perilous quest to find a wand, a journey that takes them across an ocean, to the palace of the Great Wanded fairies. Many obstacles stand between the Never fairies and their desire for peace in Fairy Haven, not the least of which are their own secret dreams. For a wand can easily tempt a fairy into making a foolish wish, with terrible consequences. 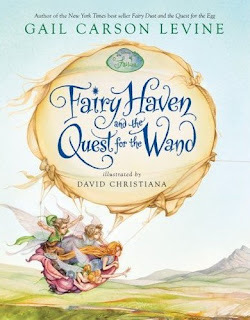 In this thrilling sequel to Fairy Dust and the Quest for the Egg, Newbery Honor-winning author Gail Carson Levine and illustrator David Christiana have conspired to spin a riveting fairytale about the dangers of dreams come true. What a great little book! The illustrations are so beautiful. I love the traditional simple style of children's books, and love any story with Tinkerbell in it! My daughter is in love with all the Disney princess books. Well what girl wouldn't?